This was my weekend to have the kids, so Chris and I went out to dinner on Thursday, the night before my birthday. This is how I’ve changed in middle age – I have no desire for more stuff in my life, so I don’t really care about gifts. But a really nice meal that I don’t have to cook? Yes, please. Funny thing, Chris was about an hour late getting home, and I wasn’t sure if I was supposed to be worried or annoyed. 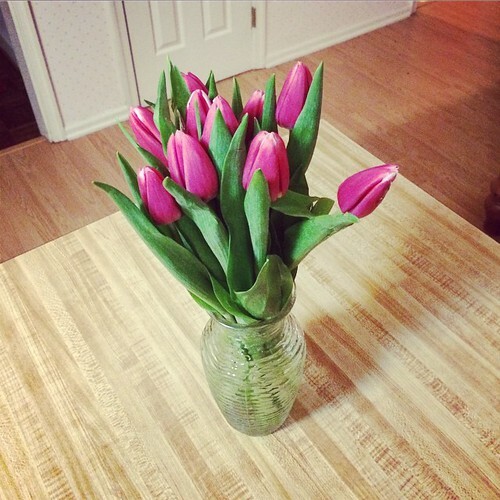 When he finally got to the house, I found out that he’d been going from one store to another trying to find tulips, because he knows they’re my favorite flower. And it’s pretty hard to find tulips in January, since they normally bloom in the spring. But he persevered. I told him that while I appreciated his thoughtfulness (he remembered my favorite flower! That’s very sweet! ), he really didn’t need to go to all that trouble. Leave the tulips for Mother’s Day, and just get whatever for my birthday. I’m pretty excited when anyone gives me flowers, it doesn’t really matter what type. Friday, my actual birthday, was… less great. Backstory: Catie’s birthday is 11 days after mine. She decided this year that she wants to have a small birthday party at our house – just her cousins and a couple of friends from school. I am completely ok with this idea, as is my checking account. But! She also decided that she doesn’t want a grocery store sheet cake (she says they make her stomach hurt, which… ok yeah, that’s legit). She says she wants a strawberry cake with vanilla frosting. Keep in mind that while I am pretty good with basic entrees and side dishes, baking is not my thing at all. I’ve successfully made a loaf of banana bread, but that’s about it. I don’t even own cake pans, the only cakes I’ve ever made were a straight-up box mix dumped into a 9×13 casserole dish. My mom found my Grandmother’s strawberry cake recipe, and it turns out that it’s almost exactly the same as this one on Taste of Home. I also found a pretty basic recipe for vanilla frosting. But since I’ve never done anything like this before, I thought I better get a practice run to make sure I could actually do it, before the day of Catie’s birthday party. So hey, my birthday! Perfect excuse to make a practice cake, right? 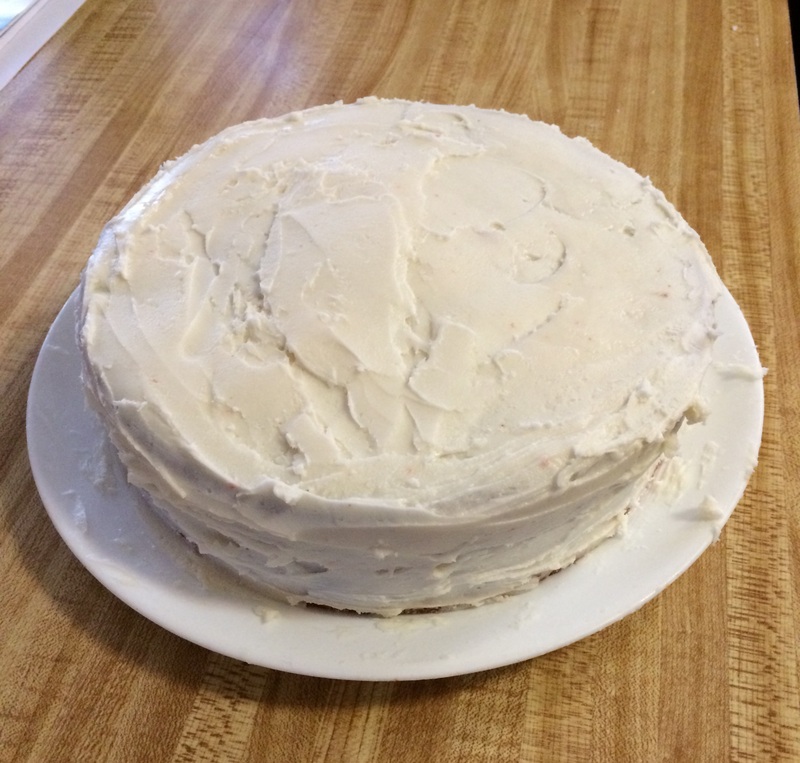 I bought some cake pans, borrowed my mom’s 10,000 pound KitchenAid standing mixer, and attempted to make a strawberry cake with vanilla frosting. The actual cake part was fine. I need to buy some wire racks for cooling the layers, because the trays I used made them stick and tear a little (I made the torn side face inward on the layers so it wasn’t obvious). But then, the frosting. The damn frosting. The texture was all wrong, it was like dried-out crumbly Play-Doh, and I couldn’t spread it, and it was starting to tear up the cake, and I just… lost it. I kept thinking that if my Grandmother was here, she’d know what to do, because she was the cake expert, and I wished she was still around to help me. Basically: a damn birthday cake made me cry. Then I sucked it up, snapped a picture of it with my phone, posted it on Twitter, and asked for help. I got several good ideas – run my spreader knife under hot water to help with the frosting that was already on the cake. And for the remaining frosting, add a few teaspoons of milk and stir like crazy until the texture was more creamy, less crumbly. I mean, look, I’m not at any risk of ending up on one of those competitive baking shows anytime soon, but I made a cake. With the help of social media, sure, but still. It counts. When I picked Catie up that evening, I told her about how I’d done this practice cake for her birthday, and I was so excited because it meant that I knew I could make the kind of cake that she wanted. And I don’t know if she was just overtired or if all kids her age are unintentionally cruel, but she just laid into me that it was NOT AT ALL the kind of cake that she wanted, and I was going to ruin her birthday with my stupid cake that was not what she wanted, and why would I do that to her, and and and…. Normally I shut it down pretty fast when my kids are rude, but it had been a long day dealing with this cake thing, and after all that work and effort that I’d put into it? I started to cry. (Again! I cried twice on my birthday! Yay me!) Which made Catie feel bad, so she started crying and apologizing. So, you know, at least she’s capable of showing remorse and isn’t a complete sociopath? I’ll take my silver linings where I can get them. We made up before we went to get Lucy at daycare, then we went to my parents’ house for dinner. And for the record? That cake was delicious. Not as good as my Grandmother’s, but that’s an impossibly high bar. The rest of my birthday weekend was nice. 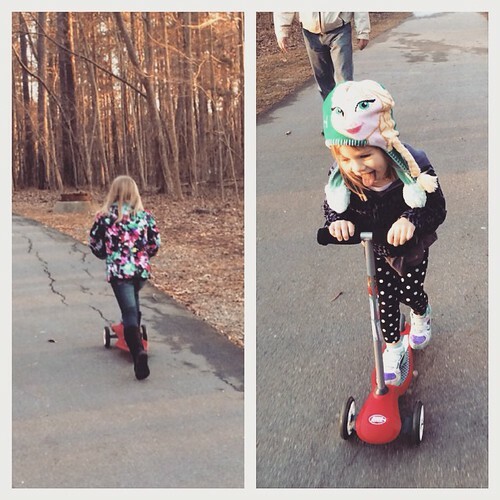 The weather has been so unseasonably mild, and we’ve taken advantage of it. Chris hung out with the girls on Saturday morning so I could go for a long run (7 miles! Also, the half marathon is less than 2 months from now! OMG! ), and when I got back, he had cooked breakfast for all of us – bacon, sausage, scrambled eggs, and French toast. Running for over an hour and then walking into a house that smells like bacon? Aaaaamazing. Later we went to my parents’ house again, so the girls could plant flowers with my mom. On Sunday, we took their scooters out to the neighborhood greenway. 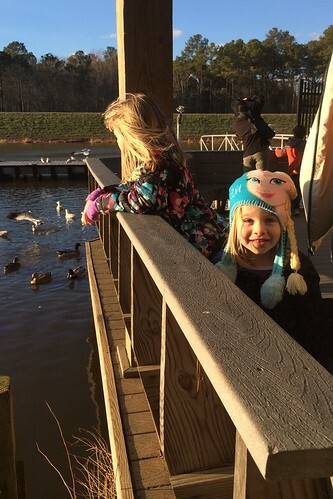 We stopped to check out the ducks and geese at the lake, and went to the playground. That was pretty fun. 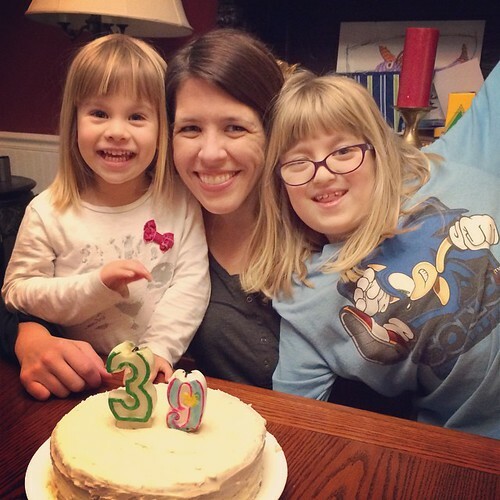 Aside from the stupid cake stuff (and I still haven’t totally figured out what I’m going to do for Catie’s birthday cake next weekend), 39 has been pretty good so far. Here’s hoping it stays that way. This entry was posted in Friends & Family, Whining by Cindy. Bookmark the permalink. Wow!!!! I’m glad it was at least tasty after all of that. I wonder if it’s worth picking out some other kind of bakery cake rather than a sheet cake? Just to save you the trouble of starting over on the baking. Those shortcake-inspired cakes are pretty nice; they have a vanilla type of cake with strawberry goo and usually a whipped cream frosting rather than the cloying sugar frostings they normally offer on sheetcakes. Just a thought. It would be so nice to just pick the thing up and have the party!!! Oh man my daughter pulled the same cake thing on me for her 4th birthday, asking for a strawberry cake. 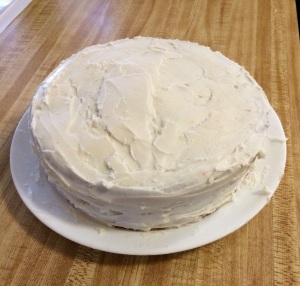 I do bake a lot, but with “special requests” from my daughter, I make her help, so even though the cake was not what she wanted (I did strawberry filling instead of the cake part) she didn’t throw a fit when we ate it since she was there when it was being put together. My point being, strawberry cake? WTF? If you want homemade, you get vanilla! I’m sorry you went through so much trouble on your birthday, and I hope you can figure out her request. My step-daughter and step-son are very finnicky eaters. On the strawberry cake deal, I do good making a chocolate cake-let alone a strawberry one. I couldn’t do it, so you have one over on me 🙂 Happy belated birthday!